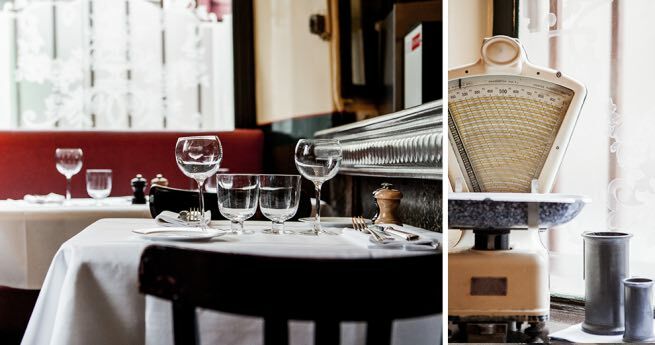 Traditional French family bistro is the choice for today. 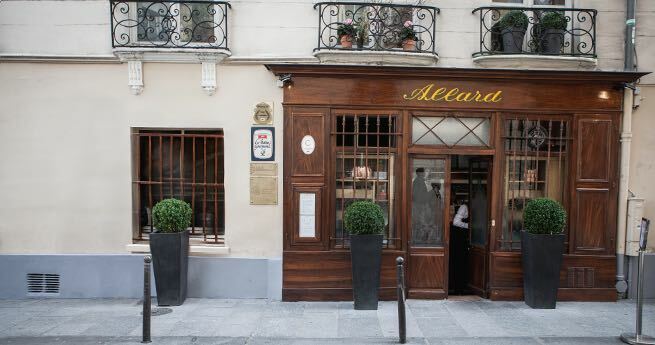 Allard has been a family restaurant since early in the 20th century with the business and the original recipes passed down through generations. It is not until we arrive that we realise it is a place we had walked past on our last trip; we had peered through lovely little windows watching busy chefs in the tiny spotless kitchen, thinking it looked fantastic and we must go sometime. 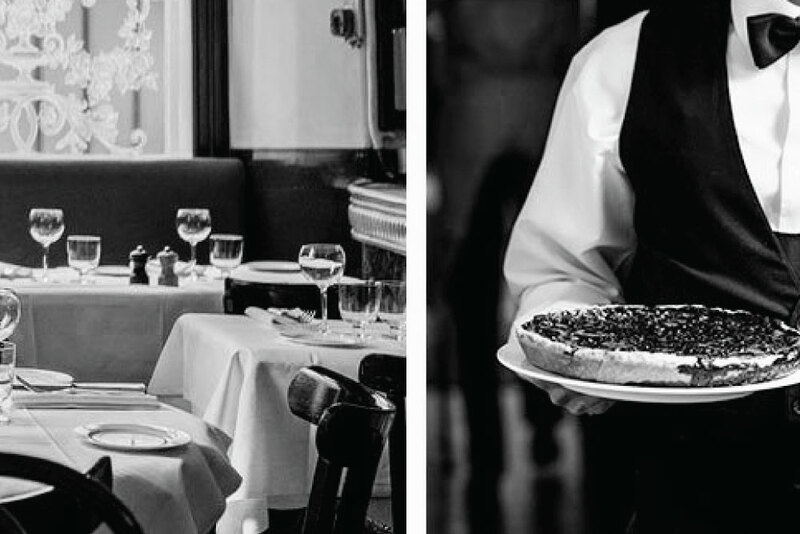 I remember being drawn to the quote on the menu…..
“our clients do not come to Allard to have an original culinary experience but to meet again with historical French recipes very dear to them” Andre Allard. The quote from Fernande who is the daughter in law of Martha Allard the original mother-cook and who was bequeathed with Martha’s recipes and secrets and with that the mantle of taking the family bistro into the next generation; also speaks volumes to me…. “my cuisine is simple and requires patience….it is essentially based on simmering and cooking lovingly…it is not for people in a hurry” Fernande Allard. For me food is more than being fed. A meal prepared with love and received with loving appreciation is a divine, sensual experience that tantalises all your senses. Here, I am looking forward to good honest simple food that honours the passion invested in those recipes so many years ago. We are not disappointed. 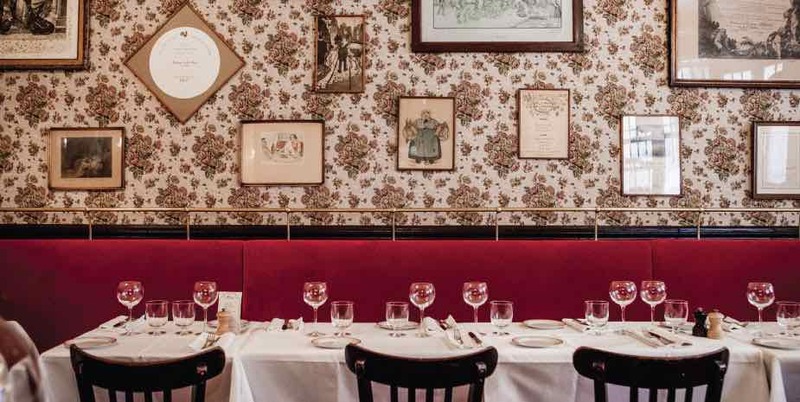 The menu is filled with traditional French recipes, duck foie gras, Ferdinande’s frog legs, ox tail and back of doe with juniper berries We opt for escargot with herb butter to start and the signature Challans Duck with olives for two, with a side of potatoes for main. The waiter immediately goes to town changing our table setting in preparation for our oyster of the garden extravaganza. With a flourish we are each presented with long two pronged forks and eyelash curlers. It turns out the waiter didn’t think I needed to touch up my makeup… The eyelash curler what-nots were apparently for holding the wee snail shell. When the dear little things arrived they looked so pretty, Amber and cream spirals glistening with butter and filled with bright green herbs. They smelled fantastic. The first attempt with the tools was tricky, trying very hard not to have the flying snail scene from pretty woman throw me off my game. Having finally secured the shell, I slide the long slender fork in and whisk the little bugger out. A raised eyebrow and a little grin, I fancy that I looked like I had done it a thousand times as I popped the tender morsel in my mouth. The herb and garlic filling was incredible and the little snail was hot and tender. Puddles of herby buttery goodness are hungrily mopped up with wood oven baked crusty grain bread. Our duck prepared to order will take 45 minutes, I love it, “not for people in a hurry”. We relax into our lovely Beaujolais and take in the atmosphere of the place. 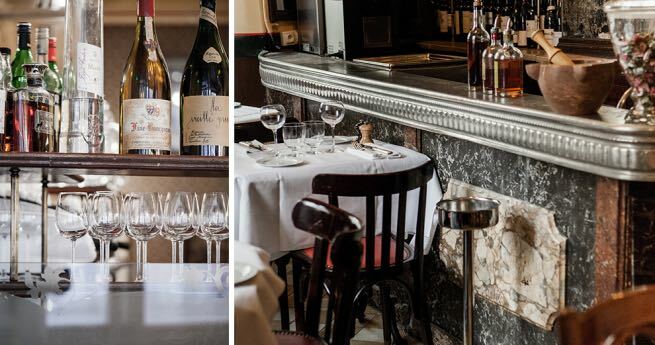 The restaurant has several small salons, seating only small numbers in each, on small tables with the ubiquitous Paris café chair. The building is very old, 1700’s perhaps, with low ceilings and doors, the walls have leaned over time and the crooked windows are covered by thick bars because it was originally a wine shop. A law from 1720 apparently required wine stores to secure their shops with bars. It has a cosy homely feel, like we are sitting in Martha’s home rather than a restaurant. It is simply decorated, dark timbers, panelled walls and ceilings, period wallpaper and large brass hooks high on the walls to hold our coats. There are only a few low hung lights, I imagine in the evening it would be dark and moody. Our table is next to the bar, a perfect spot with a little more room than some and we can pinch a little space on the bar for our water and wine freeing up some real estate on the table. This is much needed when our duck arrives. 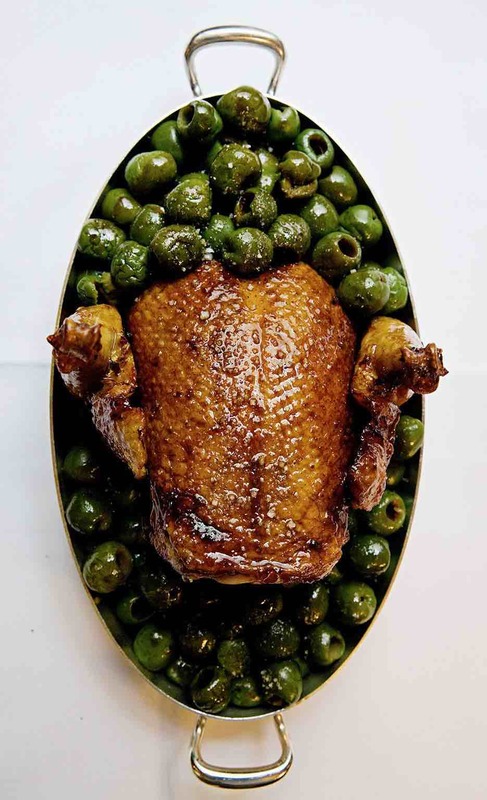 Resplendent in its silver oval platter, our duck sits floating in a shallow pool of golden jus and plentifully adorned with bright green olives. This is a very special but simple dish. Challans duck is a particular breed of duck known for very tender and lean meat. They are raised in the Vendée area of France where they are allowed to roam free along the canals, foraging for themselves. Nests are built for them to enjoy in the rushes. They are gathered up at 8 weeks old for a little fattening up for market. Our duck would have to be the best duck I have ever eaten. The skin is crisp, the meat tender and pink. It is not at all fatty. There is a lot of thick juicy meat on this bird, more than I have seen on a duck before, I’m fascinated. Each part of the bird is distinctly different in flavour, so it’s a new taste sensation with every bite. The bright green olives are warm but still firm, my favourite type of olive too. Together with a fork full of duck a stunning combination. Our side dish of potato turns out to be a little pot of tiny tiny new potatoes that have been confit to a rich deep golden brown. I’m thinking in duck fat. They taste amazing and are the perfect accompaniment. I can’t help going back for just one more spoonful of the shiny golden jus which pulls everything together so beautifully. Our duck carcass is carried away and we very contentedly ask for l’addition. No way on earth is dessert a possibility. We opt instead for a leisurely walk through historic St Germain des Pres.